I never thought I would live in a world where my daughter is the biggest Star Wars fan in the family. Or where I would know the difference between Boba and Jango Fett, but here we are and I’m having a ton of fun. Hitting Star Wars Launch Bay at Disneyland Park was top of our list of things to do during our visit. 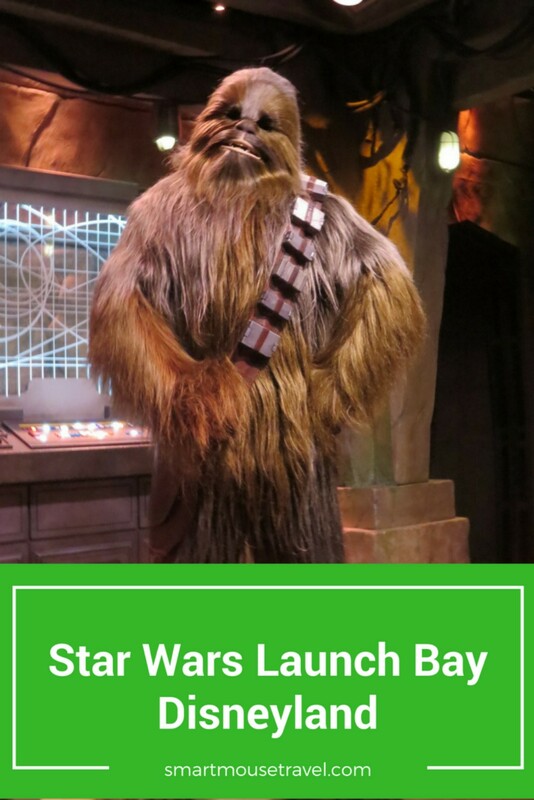 What is Star Wars Launch Bay? Star Wars Launch Bay Disneyland is a Star Wars themed indoor area. 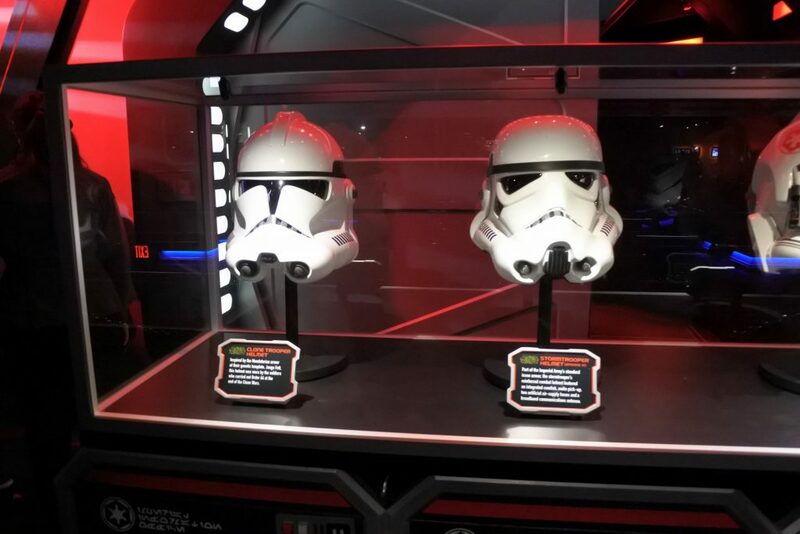 It contains a gift shop, character meeting areas for both Light and Dark Sides, a cantina set, movie props, and screens showing Star Wars related videos. Our main goal was to meet the characters, but we did look around the gift shop and real props from the movies, too. Launch Bay hours vary by season and are different than Disneyland Park hours. Check here to be sure of the exact times. The Light Side waiting area is highlighted with green lights. 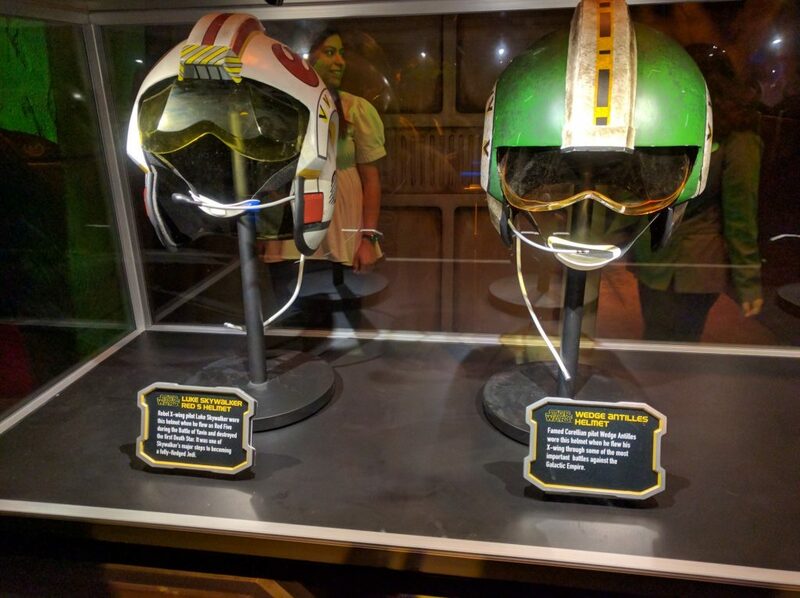 Here you will see lightsabers belonging to Jedi and flight helmets of Sabine Wren, Luke Skywalker, Wedge Antilles, and Poe Dameron. At the end of this queue we got to meet Chewbacca. He was there both times we have visited lately which is amazing. 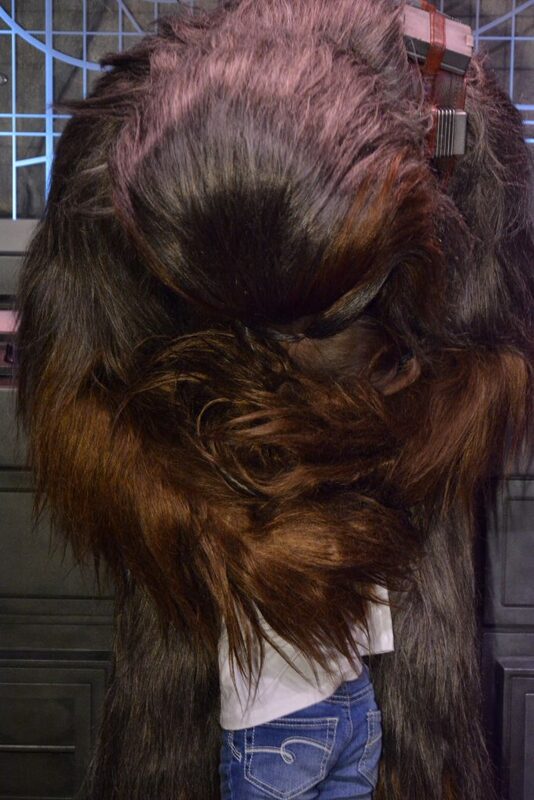 The first time we met Chewie he hugged Elizabeth so tightly we could barely see her camouflaged in his fur. And all the time he is making his Chewbacca noise. The second time was just as awesome. Elizabeth was wearing her Mickey Ears and after he hugged her he began to talk directly into the headband ears. And then when the headband came off he was momentarily distressed because he thought he had “pulled her ears off”. 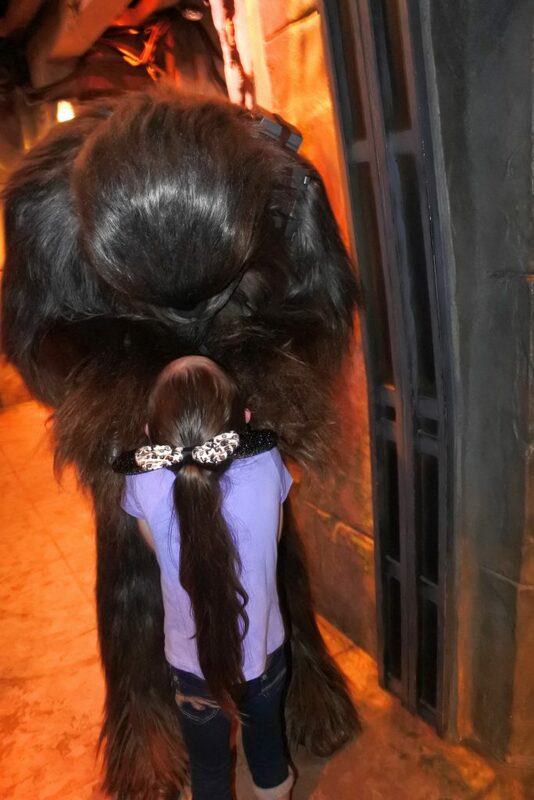 Thankfully we were able to console Chewie that she was all right before he met his next guest. 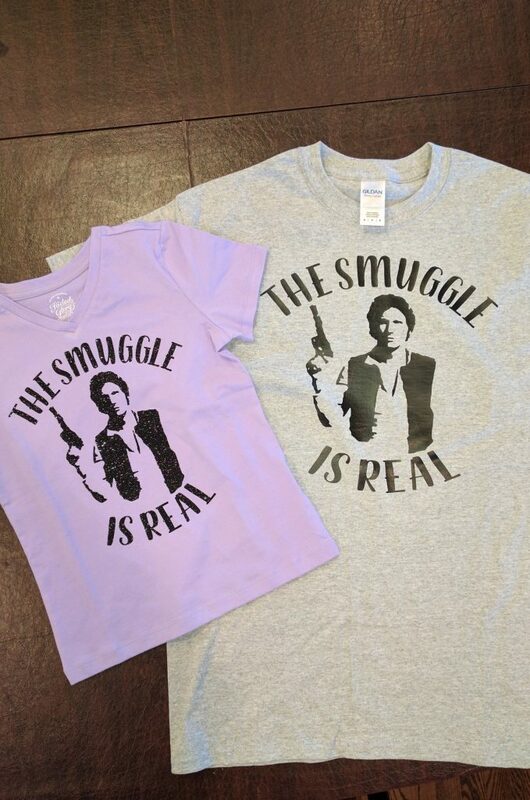 He also loved the shirt Elizabeth had custom designed because it featured his buddy Han Solo. 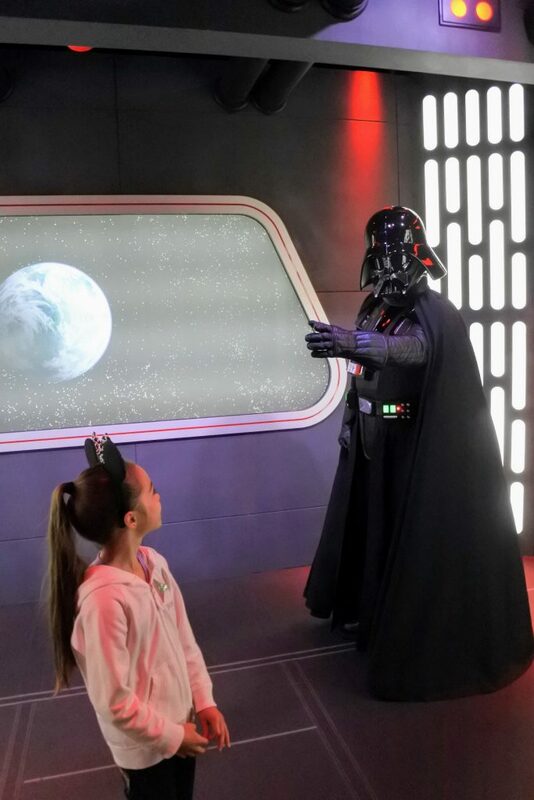 There is a Dark Side queue where we met Darth Vader (previously we had met Kylo Ren). You wait in an area bathed in red light with some displays of Sith, Empire, and First Order memorabilia. When you reach the end of the line the cast member will ask you how many are in your party and after a brief wait will usher you in for your meeting. Have your cameras ready right away. The Sith Lords both spoke to Elizabeth before we had fully entered the room. 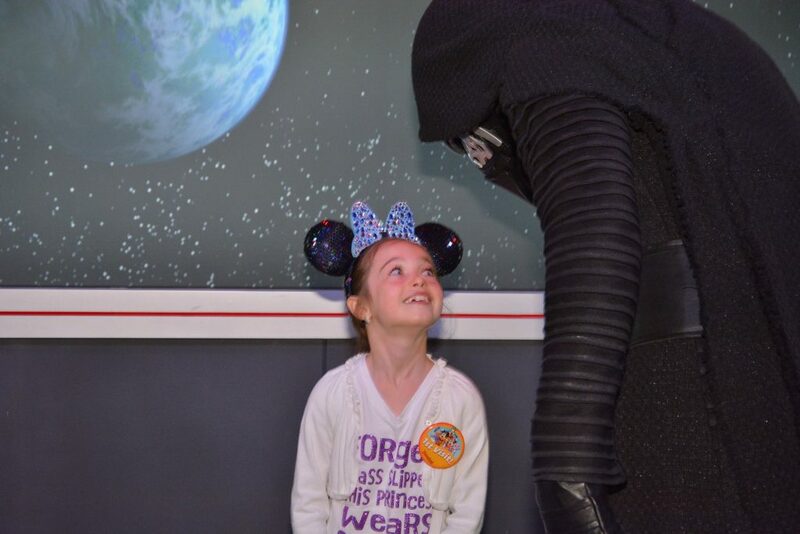 When we met Kylo Ren we found he was much more imposing than Darth Vader, but be prepared for some young children to be frightened with either. In our experience the line for the Dark Side is quite a bit shorter. 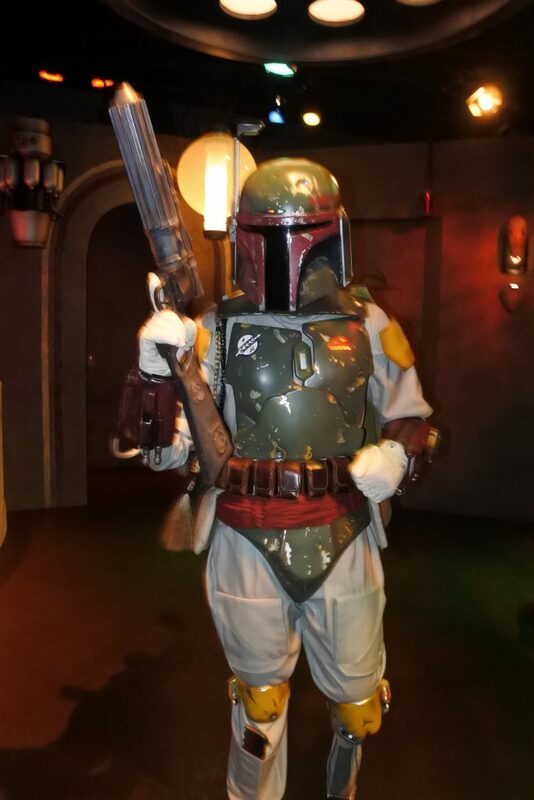 When I had been checking the Disneyland App on the morning of our park day to scope out characters to meet (find out how in this article) I saw Boba Fett was meeting people in the Cantina. Please note this does not seem to be available every day – check the app on your day in the park. This meeting area was completely unmarked and there was no indication that the area would be used for a meet and greet. I guess it makes sense a bounty hunter wouldn’t be flashy about meeting potential clients. 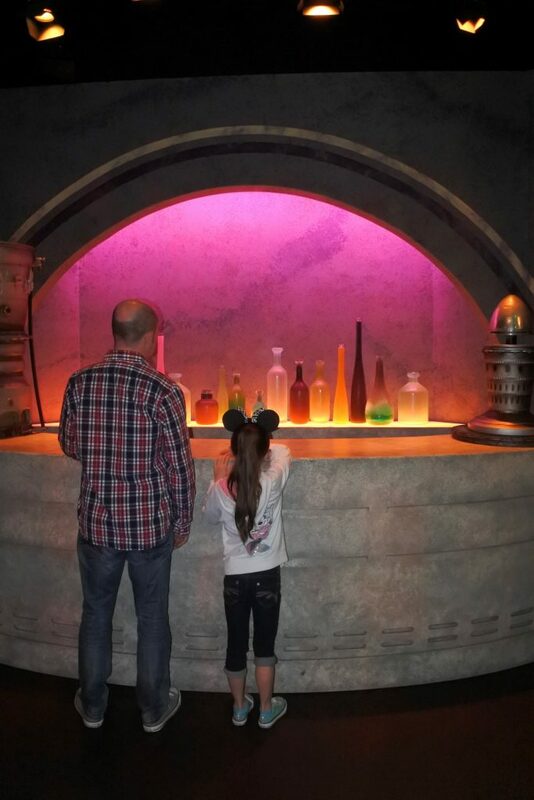 We had walked around the Star Wars Launch Bay and found the Cantina located in a dimly lit area to the side of the more obvious character locations. We were there several minutes before Boba’s scheduled time so we got to explore the little area alone. 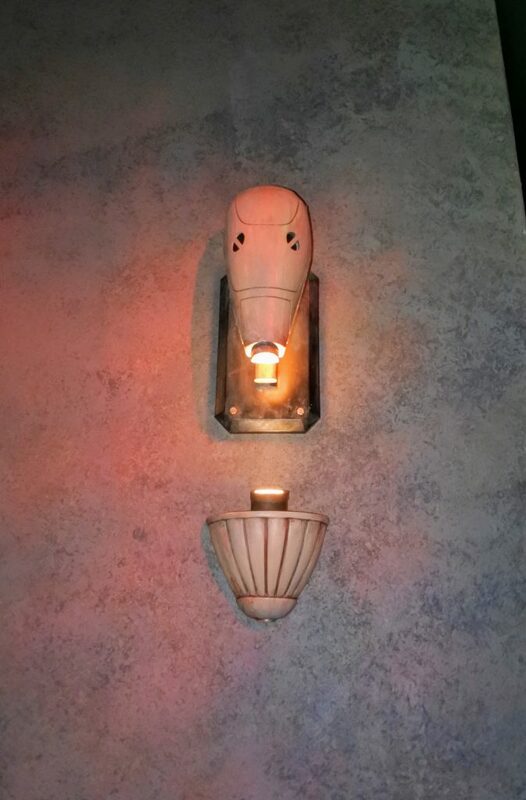 I loved some of the touches like battle droid sconces. As time drew closer for Boba Fett’s arrival two cast members and a handful of other people arrived. 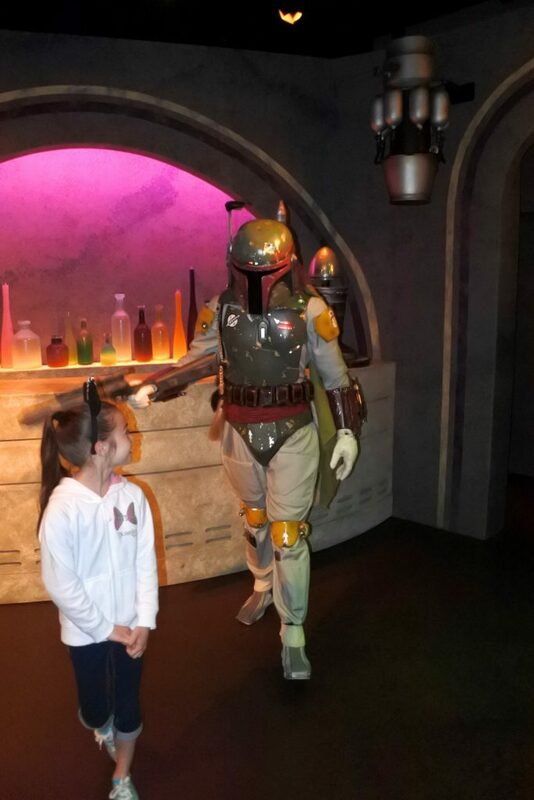 You can not make a line to meet Boba Fett until he appears. Everyone milled around awkwardly for a bit until he showed up and then everyone fell into line. Boba Fett meets you right in front of the bar inside the Cantina. Like Darth Vader and Chewbacca, he speaks but doesn’t sign autographs. In fact, he asked Elizabeth if she would sell us out. To our horror she replied that it depended on the bounty. We have now decided to be a little more careful around her. You will find high end souvenirs in this less traditional shop. Find autographed photos of many Star Wars actors, high end replica props like lightsabers modeled after the ones from the movies, custom phone cases, and other collectibles here. The Star Wars Launch Bay at Disneyland provided us three fun character interactions. We also had the chance to admire memorabilia from some of our favorite movies. In addition, this indoor attraction provided some time to cool down and get away from the crowds on a busy day. I recommend a stop at Star Wars Launch Bay Disneyland if you are a Star Wars fan. Another fun Star Wars activity I recommend at Disneyland is Jedi Training where kids have a chance to fight the Dark Side. Omg don’t even remember all these characters from Star Wars but we hope to get to Disney Ca this summer so will check this out! I wonder if all Disneyland in the world alsa launch Star Wars? Both Disneyland in California and Walt Disney World in Florida have Star Wars Launch Bay.